The tragedy that befell one Mogadishu resident has touched many Somalis on social media. Feisal Salad Samow was around the Monument of the the Unknown soldier in Bondheere district heading to Mogadishu's busy Makkah Mukaramah road. Five minutes after he passed the area a car bomb hit the vicinity of the monument of the Unknown soldier. Interestingly, he immediately posted on his Facebook account about his lucky escape. 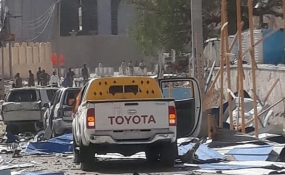 'I passed at the blast area 5 minutes before the explosion happened, may Allah protect the people' Feisal posted on Facebook. But as he reached near the National Theatre checkpoint a second car bombing occured. Feisal was seriously injured and later died in the hospital. His story attracted much sympathy on social media with Somalis sending their condolescences. His is a story of tragic events in the family intertwined by the insecurity in the Somali capital Mogadishu. According to a close friend his father was assissinated by unknown gunmen in 2016. A year later in 2017 his elder brother was among the 15 people killed in the Alshabaab Naasa Hablod hotel attack. Feisal had just secured a job at a local company after graduating from the Mogadishu University. "He was planning for a wedding with the love of his life soon" Mohamed Hussein Muse a friend said.